Two years ago, I was looking for an outfit for my husband's 40th birthday weekend in Vegas. I found the perfect black strapless jumpsuit at Bebe of all places. A bit on the dressy side, that one-piece wonder has certainly received its fair share of wear. However, one of the hottest trends of this summer season, still seem to be jumpsuits but not just your basic black. We are seeing lots of prints in Diane von Furstenberg's collection and other top designers like Stella McCartney, Vena Cava and Elie Saab are in on the action too. Lightweight fabrics in sleeveless, strapless and halter styles are just a tad bit dressier than a maxi dress and keep you looking and feeling cool during these hot summer months. If you are concerned about breaking the bank, Mossimo at Target has the cutest jumpsuit right now. 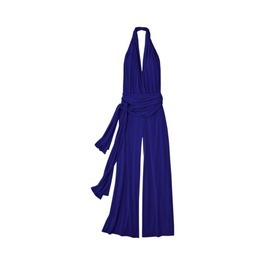 A convertible knit jersey gives you oodles of options to take this jumpsuit from day to night. It comes in basic black, grey, brown, ruby red, and oxygen blue (my personal fav).